So what movies did you get for Christmas? Movies make great Christmas gifts. Hopefully plenty of you got some good movies during you Christmas gift exchanges. Here’s what I got this year. Now show me the movies you got for Christmas this year! ‘The Wolf of Wall Street,’ ‘Her,’ and ‘This is the End’ for me! That’s an interesting assortment, Tom! You have 2013 covered. Movie related books: The Art of John Alvin and The Art of Robert McGinnis. Illustrators and Poster artists extraordinaire. Blue ray versions of Kill Bill 1/2, and About Time. Twin Peaks Blu is late in arriving. Wow! I’m envious! I dod get obe movie related book – Roger Ebert’s Great Movies. Had the app for it but now I have the hardback. Very freaking exciting for me. Made a start on it today. Now that is really cool. Had no idea Lego made that. That’ll be a beautiful project. Cheers Keith. Intending on doing a little post on the site with some cool in progress shots once it is all done. That’s a lovely selection Keith! 😀 I didn’t get any movies this year but I did get seasons 1 and 2 of House of Cards on DVD! Plus my partner got a huge boxed set of silver screen era films which I may be co-opting. 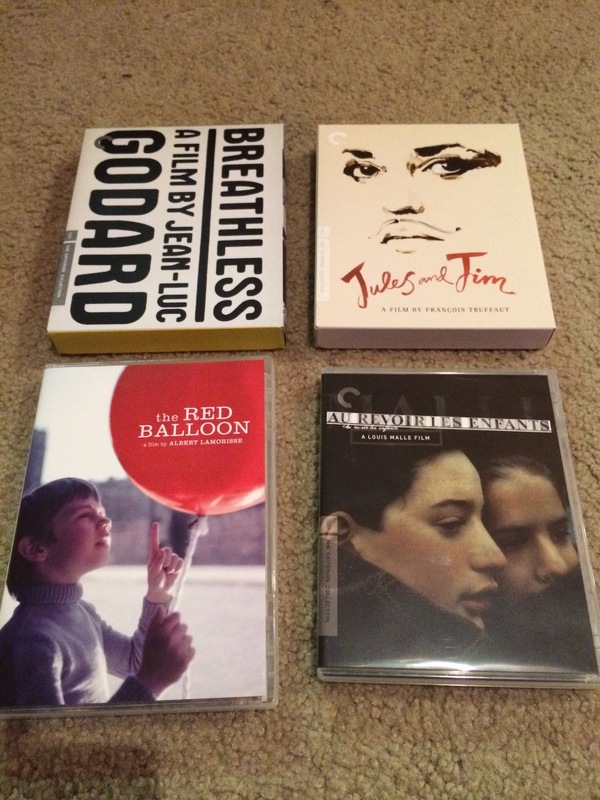 I got Criterions of Blow Out, Diabolique, and All that Jazz along with The Rose Tattoo. Haven’t seen any of them before and I’m really excited! That is awesome!!! Criterion is the best. Looks like we both have some great movie watching to do! I got a 4 pack of Marilyn Monroe’s films: Some Like It Hot (which I’ve seen before and loved), The Seven Year Itch, How to Marry a Millionaire and Gentlemen Prefer Blondes. I’m not a big Marilyn fan, but I think they’ll be fun to watch. That’s a very cool collection. I think you’ll really like like How to Marry a Millionaire as well. It’s a lot of fun. Bacall, Grable, and Monroe really click. I love The Red Balloon! I didn’t receive any movies this year unless a concert DVD counts. Isn’t The Red Balloon great? I watched it once and then again with my kids. I absolutely had to own my own copy. Back to the Future boxset, Stand by Me and Marilyn Monroe collection. Definitely is. I also got The Omen on Blu-Ray, the quality is amazing. Oh I haven’t seen The Omen in a long time. Excellent gifts Keith – enjoy. I’ve gone more modern: Guardians of the Galaxy, DotPotA, The Walking Dead season four and Star Wars blu-ray set! I am a bit of a tyrant about hoarding things so I am trying not to collect DVDs anymore because it was getting out of control. Lol! Ok. I can completely understand that. My collection was at one point a bit….out of control! When you combine mine and Mr O’s it almost needs a room of its own. I’m automatically jealous of your collection. Prior to get these I had already seen three if them. I’ve already rewatched them and I love them even more! Criterion is the best! You know I still need to see The Fault in Our Stars! I’ve heard so many great things about it. A lot of people like to say it’s just another YA-adaptation, but I was blown away by the performances. I think it’s atypical of that genre, even with some similarities. I’d love to hear what you think of it after you see it!